At the GTC Japan 2018 show, NVIDIA CEO Jen-Hsun Huang talked in broad terms about the performance of the GeForce RTX 2080 and RTX 2080 Ti. Basically, NVIDIA claims the RTX 2080 will be able to play the latest games at 4K with 60fps, whereas the RTX 2080 Ti will be able to offer over 60fps. 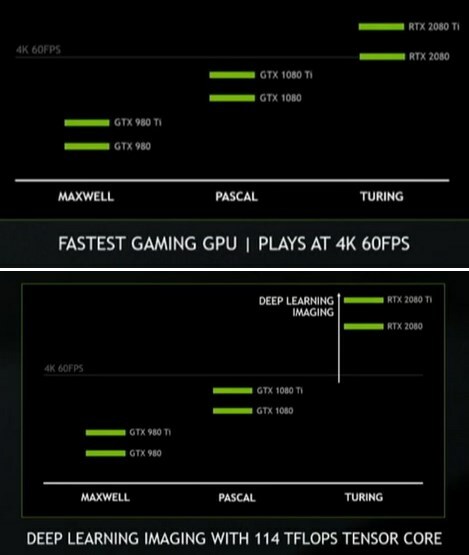 Games that support DLSS (Deep Learning Super Sampling) will see even greater performance. Reviews will hit the web on September 19th but hopefully we'll see some performance leaks over the weekend.